When the National Trust for Historic Preservation listed their America's 11 most Endangered Places list two months ago, I wondered how a Portland list would look. I drew one up one and pictured a piece that highlighted eleven endangered Portland landmarks, each with a guest advocate to write a summary of their history and status. A sort of Portland preservation Super Friends. In the two months that have passed, two landmarks at the top of my list have already been demolished: the Riverdale School, designed by A.E. Doyle and the Pagoda Restaurant in the Hollywood District. Others remain in the news. The University of Oregon's recent over-reach in wanting to place neon signs on the Old Town water tower upended Commissioner Randy Leonard's "compromise" on the Made in Oregon sign. It presents an opportunity to re-examine the proposed changes to the sign. The "compromise" involved the removal of the word University from U of O's proposed re-branding of the sign, leaving just the word Oregon. 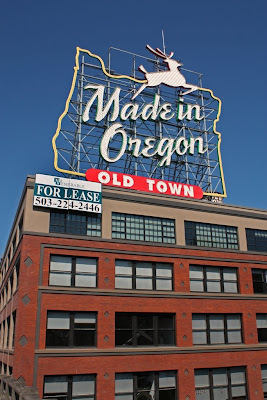 The signs current Made in Oregon logo is not "historic" per se, but it can't be denied that it is a landmark and local icon, even to the point of appearing on posters and books that promote Portland. What is lost with the "compromise is a prominent visual element, the serif on the letter M in the word Made that adds to the sense of motion to the sign, a holdover from the original W of the White Satin and White Stag incarnations. The round O in Oregon has no such element (frankly, the U in University would). Whatever the case, community input has been lacking in what so far has been a power struggle between City Hall and the University of Oregon. Memorial Coliseum's fate is still very much up in the air. A recent spate of letters to local media outlets appear designed to foster the impression there is massive sentiment in Portland to demolish the building (one letter writer in the Oregonian shilled that the only people who appreciated the building was a small group of elitist architects). The letters talk of putting Memorial Coliseum "back on the table" (read under the wrecking ball) as the possible solution to Portland's decades long effort to find a viable home for baseball. What new use is possible for the Coliseum? How will it be paid for? It will require imagination. Here is some. How about a Blazer game (or Blazer exposition game) in Memorial Coliseum with the current team in 1977 finery and appearances from the championship squad and local personalities from that era? The crowd would be encouraged to wear their uber-70s best. I for one would pay extra to see what I missed the first time. All proceeds would go to upkeep and upgrades to the building. One great night is not enough to solve the problem, but it could be part of the solution. How many solar panels could the roof of Memorial Coliseum hold? When it comes to re-use and preservation (the Greenest building is the one that is already built) Portland's record is not so impressive. 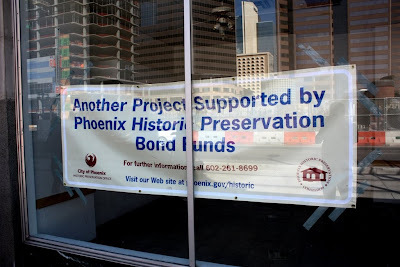 Phoenix Arizona has a landmarks commission (like Portland has) and a Historic Preservation Office (not so Portland). It even uses preservation bonds to renovate buildings. 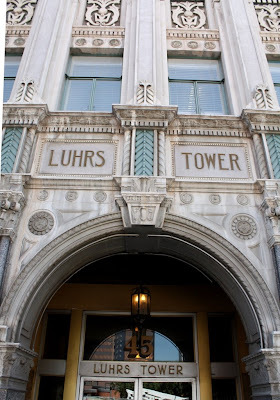 The Luhrs Tower in Phoenix Arizona, renovated by that city's preservation bonds. 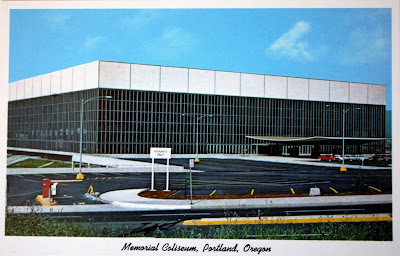 If Memorial Coliseum is renovated for a sustainable use, Portland will have a major example of its Green commitment, a marketable story; otherwise, just talk. Finally, speaking of imagination, after years of starving the Oregon Historical Society, the Oregon Legislature has approved to allocate part of the proceeds from re-issue of the classic New Frontier era "Pacific Wonderland" slogan license plates (originals modeled here by by beloved 1962 Ford Falcon, my 1980s ride) to support the Oregon Historical Society. I'm also proud to report that Powells Books , my employer, has an offer for people to donate the proceeds from selling their used books at Powells to the Oregon Historical Society as a fully tax deductible donation. Details here. 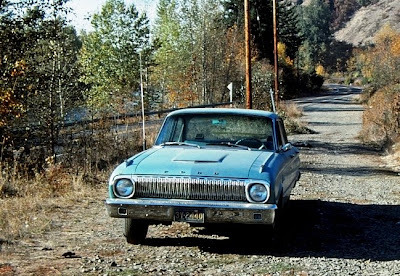 Postscript- if anyone sees a 1962 blue Ford Falcon license Oregon 3Y-2440, let me know. I know someone who would really like to buy it back.